After forgetting my camera on Squaw last January, a photographic return. 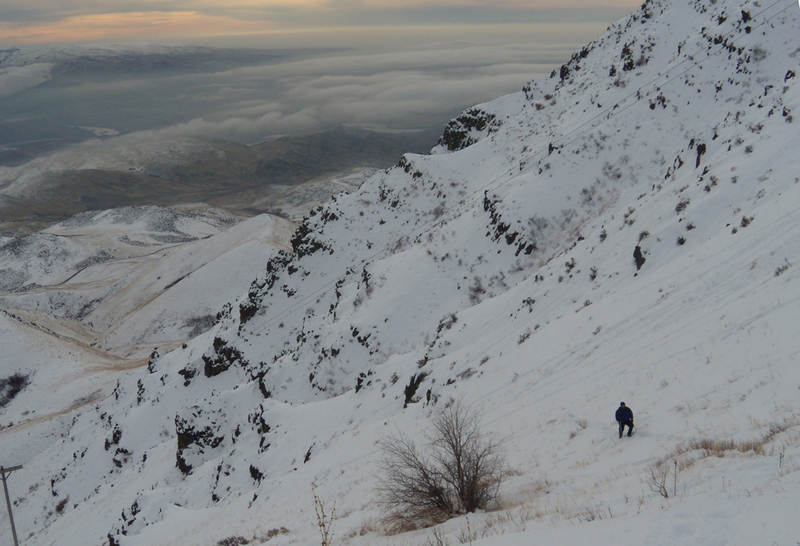 I climbed Squaw Butte last January as a training hike for Denali. Two things stand out from that trip: I forgot the camera (!) and on the descent we got lost in the fog. 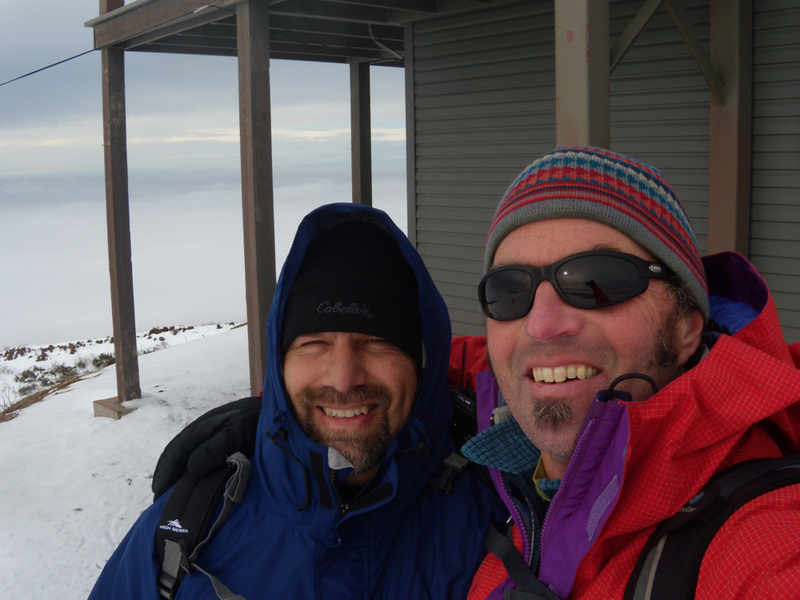 Steve wanted to "show me around" on his fave local peak, so we were off to Squaw once again. We met at Shady Acres, near the junction of Hwy 44 and 16, and were heading for Emmett a little after 7. When we got to the top of the road, it was quite snowy, but the snow was hard enough along the roadside to support my car. But as soon as we left the snow affected by the plow, we switched to snowshoes. I thought the weeds would snag the snowshoes, but it wasn't bad. And the snowshoes made travel in the crunchy snow much easier. 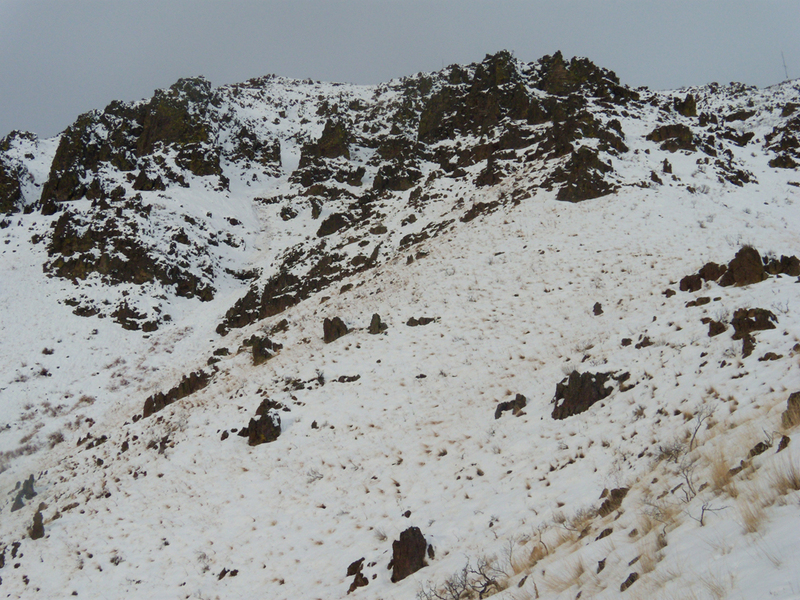 The picture is taken from farther up the mountain, with the SE rib in view. From here and above, we saw deer all over the place, well over 100. We also heard lots of coyotes, but only saw one. There is a major false summit part way up. When we got to the saddle, Steve decided he wanted to try a different route. 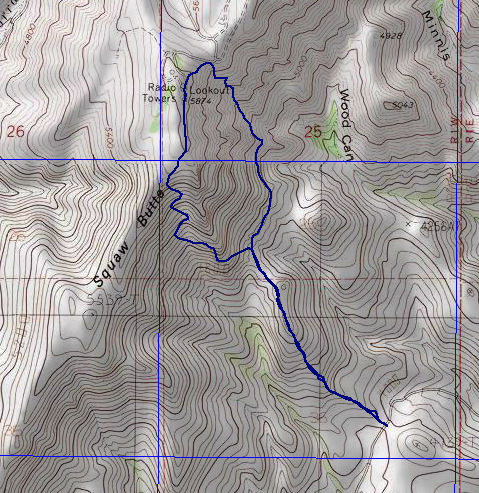 So instead of continuing up the SE rib, we started traversing north, headed for the gully in which the power lines run. 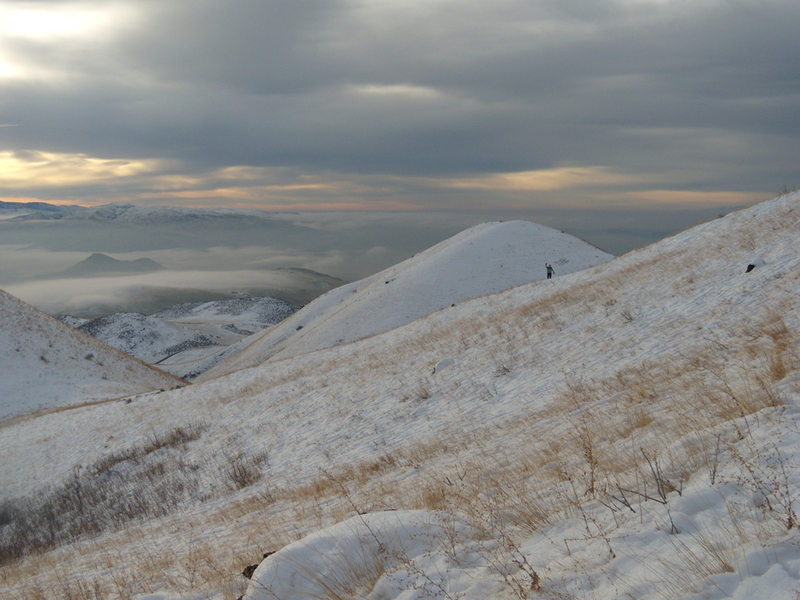 The light breeze was stirring up the inversion muck that hung over Boise, sliding it across the hills like a stream. And the hills and mesas looked like stones in the stream. Here you can see Steve on the right, a tiny silhouette against the false summit in the background, traversing toward what he now calls the "Prime Rib." As we worked our way across the hillside, we got lots of opportunity to inspect the rocky cliffs and gullies. This gully had avalanched. 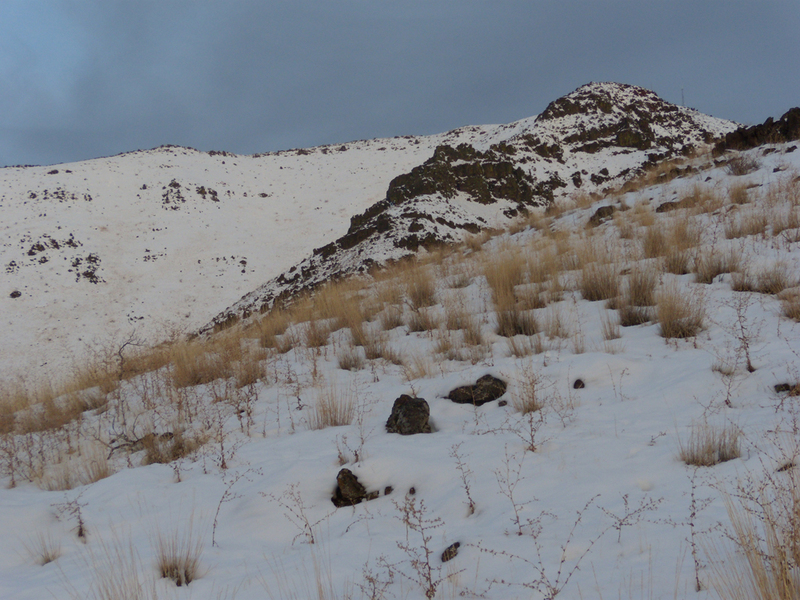 On a different day, these various gullies might provide some fun snow climbing. 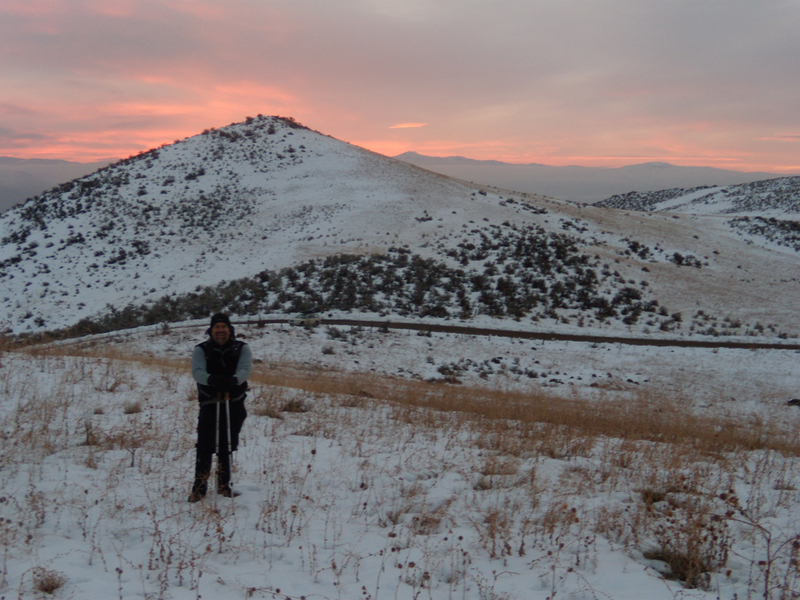 With the funky snow conditions and steep hillsides, the traverse took more time than we expected. But it was good fun and the scenery was splendid. You can see a power pole in the bottom left corner; we were finally in the gully and moving up quickly. From the top of the gully, it is a short jaunt south to the summit. But it didn't seem short: the snow was deep and soft, making us sink in past our knees even on snowshoes. Perhaps there were tumbleweeds underneath? 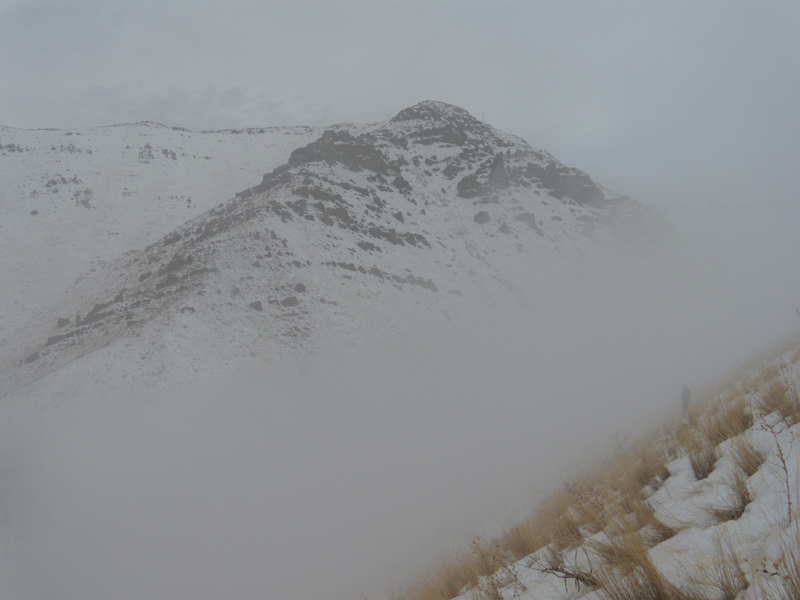 We descended the standard SE Rib route, racing the fog with my distant memory of getting lost in the fog here last time. But this time the fog was moving in and out, so was actually quite entertaining. Steve is on the hillside on the lower right. Here's a map with our approximate route.